Fall was a fortunate season at the Tonnemaker farm in Royal City, Washington. A warm October provided brothers Kurt ’84 and Kole a few extra weeks of squash, tomatoes, and peppers to load into their trucks and deliver to farmers markets and restaurants around the state. 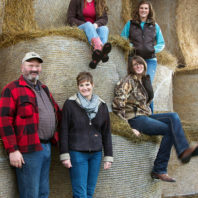 This family farm has changed since the current generation took charge of it. It was established by WSU extension agent Orland Tonnemaker ’22 and his wife Pearl. In 1962 they planted orchards of cherries, pears, and apples. Like many of the farms around them, they sold their fruit to area warehouses. Mix all ingredients, stuff peppers, top each pepper with tomato sauce. Bake at 350 degrees for one hour. Top with cheese last five minutes. P.S. Please be mindful we are country cooks and don’t measure a thing. These are approximate amounts. Just play around with it! The small farming community of Green Bluff lies nestled in the foothills of Mt. Spokane. Its bucolic setting belies the fact that it’s just 15 miles north of Spokane. Take a meandering drive around “the Bluff,” and you’ll pass by dozens of family farms, each with its own roadside fruit stand. Stop at any one for fresh fruit and locally made jam, wine, cider, pie, and other harvest bounty. Asparagus is harvested in the spring, when its first shoots come through the earth, long before the plant has the benefit of maturing. Farming in the Skokomish River Valley can be a challenge, what with 60 to 80 inches of rain a year. One year, Hunter Farms’s pumpkin fields flooded, the pumpkins bobbing like buoys on a temporary sea. Fortunately, the river receded in time for families across the South Puget Sound region to visit Hunter Farms and cart home their pumpkins.